Last Term students rallied in support for WSSC’s stance against violence, joining in on the causal clothes day and purchasing a teal ribbon. On October 18th our Student Leadership Council held a day of fundraising which also aimed to raise awareness about violence within our local community. UMFC (Upper Murray Family Care) Child and Family Safety Team were invited to present to students on the day, providing vital information on how violence impacts and effects children and young people. 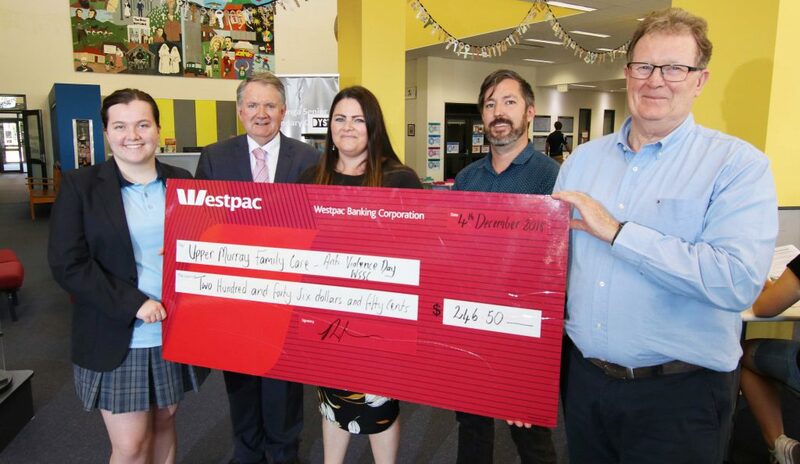 The Wodonga Senior Secondary College Day Against Violence raised money for UMFC by holding a casual clothes day and handing out teal ribbons. The Student Leadership Council are proud to say that $250 was raised for Upper Murray’s Trust in Kids program (TIK). Trust in Kids was developed when the UMFC board had a vision to Give Kids the Opportunities to Grow Their Dreams. Trust in Kids is individually tailored to meet the needs of children and young people up to 21 years who have limited opportunities because of family, social, financial or other individual circumstances. Some of these children are affected by issues relating to family violence, mental health and drug and alcohol use. The fund is available for educational, social, recreational and cultural opportunities. Today Student Leadership Council representative Emma Morrison and College Principal Vern Hilditch presented the cheque to the UMFC TIK fund.